Ever since I’ve eaten the delicious Eritrean food served up in the Adulis restaurant in London, I’ve wanted to homecook some of this part of Africa’s amazing cuisine. Of particular interest of course was the soft, spongy, sour flatbread called injera. 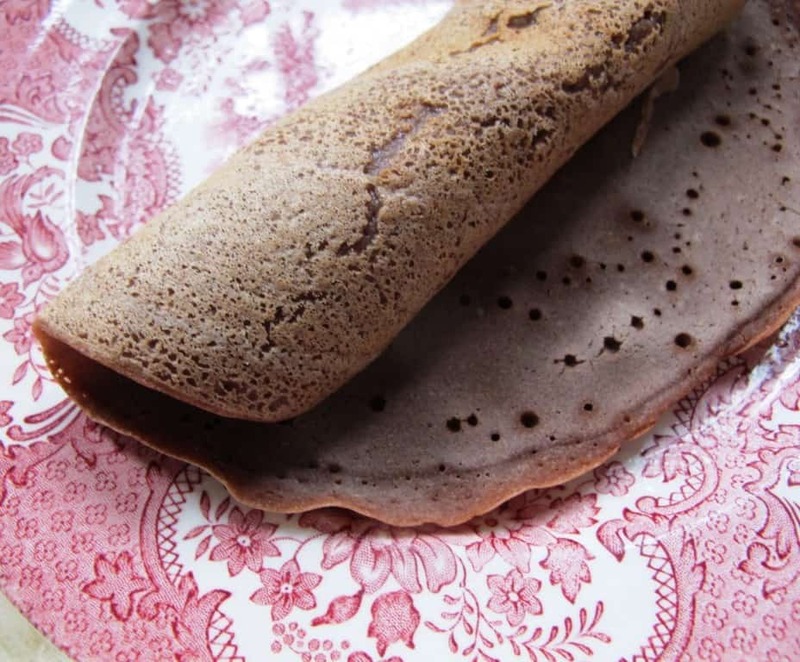 Injera has a distinctive porous texture. It serves as food, plate and eating utensil all at the same time as it lines the serving dishes on which tasty meat and vegetable stews are presented. Injera soaks up the flavours and scoops up the juices. The national bread of Ethiopia and Eritrea, where it is served with almost every meal. 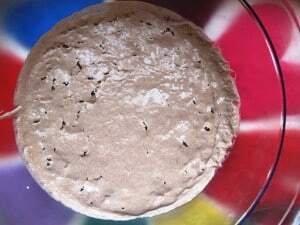 A flatbread made by pouring fermented pancake-like batter on a hot surface. 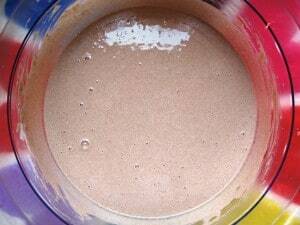 Injera batter should be made at least a day ahead (up to three days in advance) – to ferment at room temperature. Injera will become more sour, the longer you leave it. It’s traditionally made with teff flour. Teff is a tiny grain which grows in the grasslands of Ethiopia. It’s nutritious, high in fibre and minerals (particularly calcium) and gluten free. 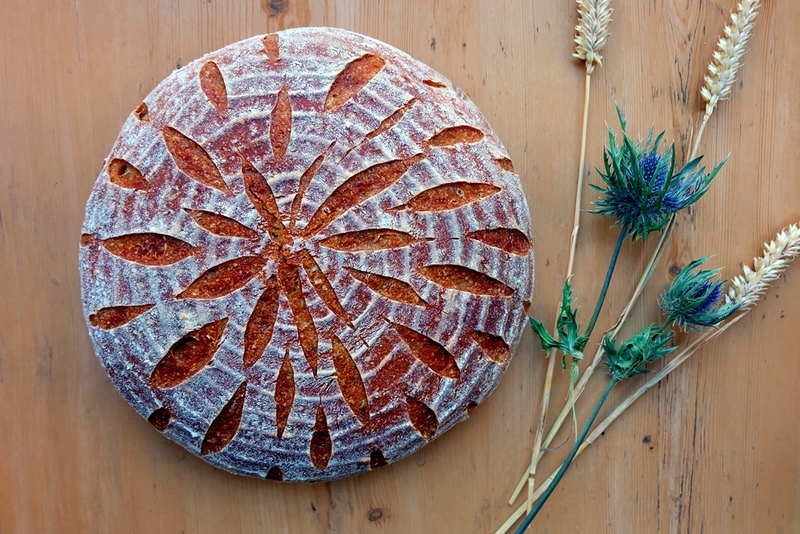 White and brown teff flours are available, however they come at a cost and are not easy to find. 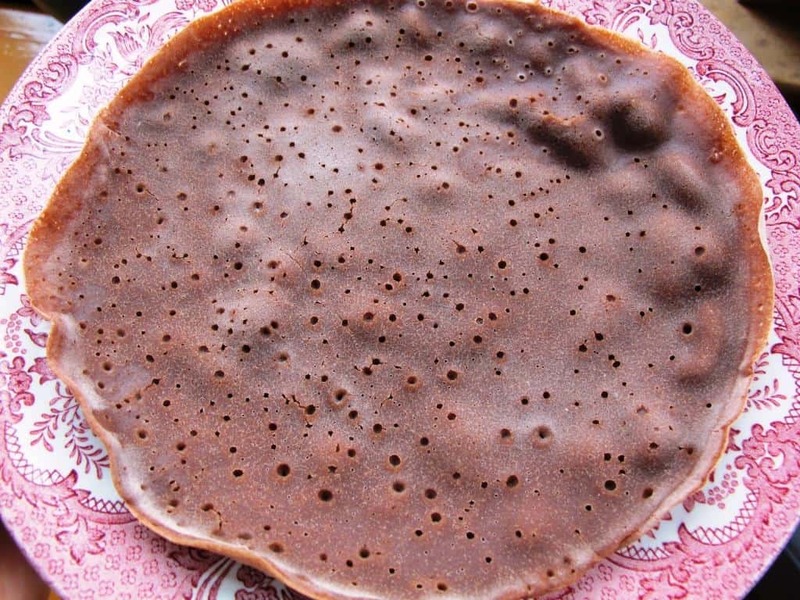 Injera is best made on a special stove or clay plate called mitad or mogogo placed over a fire. If you don’t have this, you should be okay with a non-stick frying pan (make sure the surface is completely smooth and not scratched) or a cast-iron wok. You’ll also need to have a tight-fitting lid for your pan. It’s taken me quite a bit of practice to get the injera batter right, so don’t get disheartened if your first few attempts are not perfect! Mix 2 tbsp of your sourdough starter (mine is a rye/wheat sourdough starter) with 50g teff flour and 50g lukewarm water. Cover and leave at room temperature. 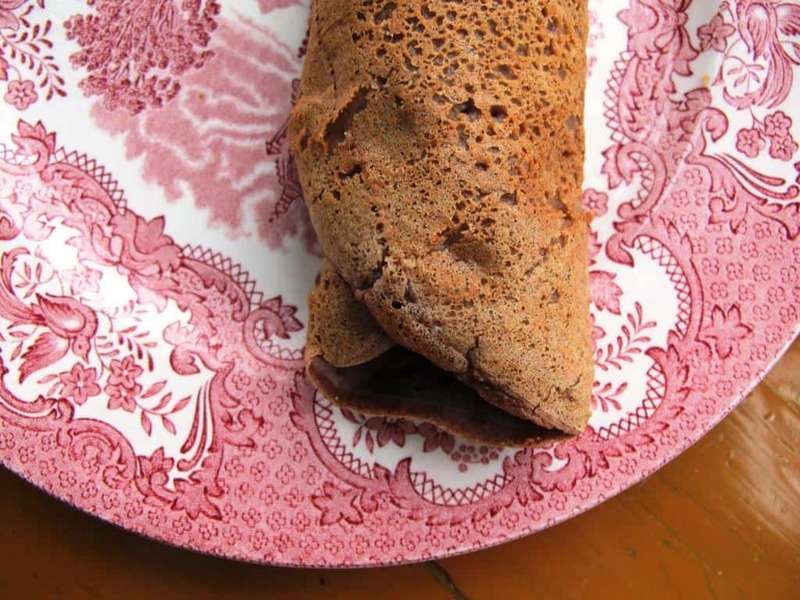 Add the remaining teff flour (300g) and – while stirring – slowly add water until you get a pancake-like batter. The batter should be smooth and coat the back of a spoon like thick double cream. If the batter is too thin, the bubbles won’t be able to form and the dough will crack whilst cooking. 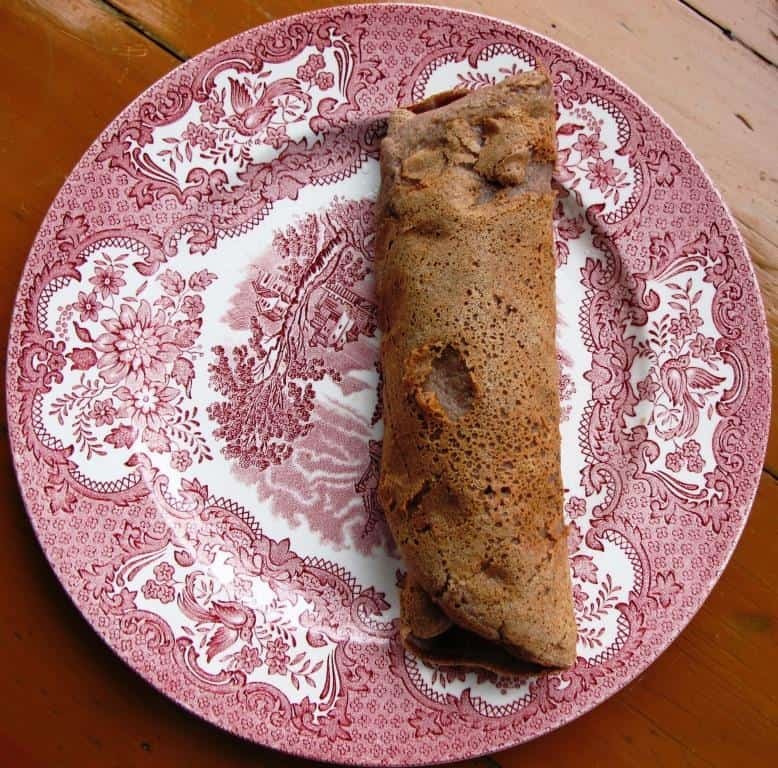 If the batter is too thick, it won’t look like traditional injera, more like a heavy lump of fried bread. The amount of water you will depend on the consistency of your starter and on the type of flour you use… so adjust as necessary. Ferment again at room temperature: cover and let stand for 4 hours. Once the final fermentation is complete, add the salt and stir to dissolve. I don’t have a mittad and therefore use a non-stick frying pan. Place your frying pan over a medium heat. Don’t allow the frying pan to get too hot. Pour a layer of batter into the pan. Start pouring the batter in a swirling circle from the outside of the pan. Move gradually inward until the bottom of the pan is completely covered. Tilt and swirl the pan to distribute evenly. Allow to cook for 30 seconds or until just set, then cover the pan with a lid for another minute or two. Holes will appear on the surface, the top will fully set and the edges will begin to curl. Don’t turn and don’t allow to brown. Carefully transfer to a clean kitchen towel or plate, then move on to the next one. You can place them on top of each other. They tend to be very sticky when warm, but become easy to handle once they reach room temperature. Serve with spicy East African meat and vegetable stews. I made these versions of Doro Wat and Kik Alicha. Use your hands to tear and scoop! Garnish with lime, black olives, tomatoes. If you plan to make injera regularly, save a few tablespoons of the starter and refrigerate in a jar. If you keep teff starter in the fridge, a very dark watery liquid will gather on top. Discard this black-ish liquid before you use your starter again.